Dr. Daqing ZHANG has been a full professor in Département Réseaux et Services Multimédia Mobiles at Télécom SudPais and CNRS, France, since 2007. 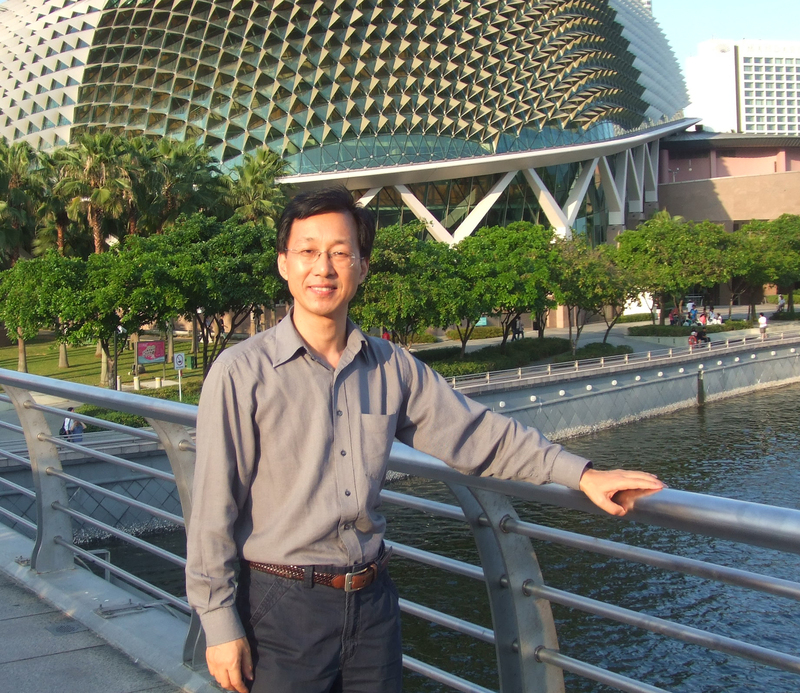 He initiated and led the research in Smart Home, Healthcare/Elderly care and context-aware computing from 2000 to 2007 at the Institute for Infocomm Research (I2R), Singapore. He was the founding head of Connected Home Lab (2003-2004), the founding head of Context-Aware Systems Department (2004-2006) and the founding head of IMACA group (2006-2007) at I2R, Singapore. He has served as general chair/program chair for 15 international conferences/workshops and given 22 keynote talks in various international events. He is the associate editor in 3 international journals including IEEE Pervasive Computing, Proceedings of ACM IMWUT and ACM TIST. He also served in the technical committee for top ubiquitous computing conferences such as UbiComp, Pervasive, PerCom, etc..
Daqing's research interests include context-aware computing, mobile computing, big data analytics, ambient assistive living and urban computing. He has published over 200 papers in referred journals, conferences and books, where his work on context model and middleware is widely accepted by pervasive computing, mobile computing, networking and service-oriented computing communities. His research work got around 13,000 citations with H-index of 55 (according to Google Scholar as of Nov. 2018). He is the winner of the Ten Years CoMoRea Impact Paper Award at IEEE PerCom 2013, the Honorable Mention Award at ACM UbiComp 2015 and 2016, the Best Paper Award at IEEE UIC 2015 and 2012 and the Best Paper Runner Up Award at Mobiquitous 2017 and 2011. All Daqing's research has been motivated by practical applications in digital cities, smart home and elderly care. In recent years, he has been exploring new areas such as "Social and Community Intelligence (SCI)", "Mobile Crowd Sensing (MCS)" and "Contactless Sensing" which aim to push context-aware computing to new frontiers. Daqing Zhang is a Fellow of IEEE, he obtained his Ph.D. from University of Rome "La Sapienza", Italy in 1996. Best Paper Award, "How Long a Passenger Waits for a Vacant Taxi? - Large-scale Taxi Trace Mining for Smart Cities", IEEE CPSCom 2013, Beijing, China, August 20-23, 2013. Best Paper Award, “Predicting Mobile Phone User Locations by Exploiting Collective Behavioral Patterns”, IEEE UIC 2012, Fukuoka, Japan. 12 Program Chair, The 2012 IEEE Asia-Pacific Services Computing Conference (APSCC 2012), Guilin China. TPC for UbiComp 2015, PerCom 2014, PerCom 2013, PerCom 2011, SocialCom 2011, UbiComp 2008, Pervasive 2008, PerCom 2008, etc 50 + conf. Steering Committee for ICOST, MUE, etc. Jiangtao Wang, Yasha Wang, Daqing Zhang, Sumi Helal. Energy Saving Techniques in Mobile Crowd Sensing: Current State and Future Opportunities. IEEE Communications Magazine, 56(5): 164-169 (2018). Suiming Guo, Chao Chen, Jingyuan Wang, Yaxiao Liu, Ke Xu, Daqing Zhang, Dah Ming Chiu. A Simple but Quantifiable Approach to Dynamic Price Prediction in Ride-on-demand Services Leveraging Multi-source Urban Data. The Proceedings of the ACM on Interactive, Mobile, Wearable and Ubiquitous Technologies (IMWUT/Ubicomp 2018), 2(3): 112:1-112:24 (2018). Jiangtao Wang, Leye Wang, Yasha Wang, Daqing Zhang, Linghe Kong. Task Allocation in Mobile Crowd Sensing: State-of-the-Art and Future Opportunities. IEEE Internet of Things Journal, (2018). Longbiao Chen, Dingqi Yang, Daqing Zhang, Cheng Wang, Jonathan Li, Thi Mai Trang Nguyen. Deep mobile traffic forecast and complementary base station clustering for C-RAN optimization. Journal of Network and Computer Applications (JNCA), (2018). Youwei Zeng, Dan Wu, Ruiyang Gao, Tao Gu, Daqing Zhang. FullBreathe: Full Human Respiration Detection Exploiting Complementarity of CSI Phase and Amplitude of WiFi Signals. The Proceedings of the ACM on Interactive, Mobile, Wearable and Ubiquitous Technologies (IMWUT/Ubicomp 2018), 2(3): 148:1-148:19 (2018). Xiang Li, Daqing Zhang, Jie Xiong, Yue Zhang, Shengjie Li, Yasha Wang, Hong Mei. Training-Free Human Vitality Monitoring Using Commodity Wi-Fi Devices. The Proceedings of the ACM on Interactive, Mobile, Wearable and Ubiquitous Technologies (IMWUT/Ubicomp 2018), 2(3): 121:1-121:25 (2018). Kai Niu, Fusang Zhang, Jie Xiong, Xiang Li, Enze Yi, Daqing Zhang. Boosting fine-grained activity sensing by embracing wireless multipath effects. The Proceedings of the 14th ACM International Conference on emerging Networking EXperiments and Technologies (CoNEXT 2018), (2018). Jiangtao Wang, Yasha Wang, Daqing Zhang, Feng Wang, Haoyi Xiong,Chao Chen, Qin Lv, Zhaopeng Qiu. Multi-Task Allocation in Mobile Crowd Sensing with Individual Task Quality Assurance. IEEE Transactions on Mobile Computing (TMC), (2018). Leye Wang, Daqing Zhang, Dingqi Yang, Animesh Pathak, Chao Chen, Xiao Han, Haoyi Xiong, Yasha Wang. SPACE-TA: Cost-Effective Task Allocation Exploiting Intradata and Interdata Correlations in Sparse Crowdsensing. ACM Transactions on Intelligent Systems and Technology (TIST), 9(2): 20:1-20:28 (2018). Daqing Zhang, Hao Wang, Dan Wu. Toward Centimeter-Scale Human Activity Sensing with Wi-Fi Signals. IEEE Computer, 50(1): 48-57 (2017) (Cover Feature). Bin Guo, Huihui Chen, Qi Han, Zhiwen Yu, Daqing Zhang, Yu Wang. Worker-Contributed Data Utility Measurement for Visual Crowdsensing Systems. IEEE Transactions on Mobile Computing (TMC), 16(8): 2379-2391 (2017). Hao Wang, Daqing Zhang, Yasha Wang, Junyi Ma, Yuxiang Wang, Shengjie Li. RT-Fall: A Real-time and Contactless Fall Detection System with Commodity WiFi Devices. IEEE Transactions on Mobile Computing (TMC), 16(2): 511-526 (2017). Chao Chen, Daqing Zhang, Xiaojuan Ma, Bin Guo, Leye Wang, Yasha Wang and Edwin Sha. CrowdDeliver: Planning City-wide Package Delivery Paths Leveraging the Crowds of Taxis. IEEE Transactions on Intelligent Transportation Systems (T-ITS), 18(6): 1478-1496 (2017), (Featured by IEEE Spectrum). Longbiao Chen, Jeremie Jakubowicz, Dingqi Yang, Zhaohui Wu, Daqing Zhang, Gang Pan. Fine-Grained Urban Event Detection and Characterization Based on Tensor Co-Factorization. IEEE Transactions on Human-Machine Systems (THMS), 47(3): 380-391 (2017). Leye Wang, Daqing Zhang, Haoyi Xiong, J. Paul Gibson, Chao Chen, Bing Xie. ecoSense: Minimize Participants’ Total 3G Data Cost in Mobile Crowdsensing Using Opportunistic Relays. IEEE Trans. on Systems, Man, and Cybernetics: Systems (TSMC), 2017. Haoyi Xiong, Daqing Zhang, Zhishan Guo, Guanling Chen, Laura E. Barnes. Near-Optimal Incentive Allocation for Piggyback Crowdsensing. IEEE Communications Magazine, 55(6): 120-125 (2017). Zhiyong Yu, Daqing Zhang, Zhu Wang, Bin Guo, Ioanna Roussaki, Kevin Doolin, Ethel Claffey. Toward Context-Aware Mobile Social Networks. IEEE Communications Magazine, 55(10): 168-175 (2017). Dan Wu, Daqing Zhang, Chenren Xu, Hao Wang, Xiang Li. Device-Free WiFi Human Sensing: From Pattern-Based to Model-Based Approaches. IEEE Communications Magazine, 55(10): 91-97 (2017). Bin Guo, Huihui Chen, Zhiwen Yu, Wenqian Nan, Xing Xie, Daqing Zhang, Xingshe Zhou. TaskMe: Toward a dynamic and quality-enhanced incentive mechanism for mobile crowd sensing.International Journal of Human-Computer Studies, 102: 14-26 (2017). Xiang Li, Daqing Zhang, Qin Lv, Jie Xiong, Shengjie Li, Yue Zhang, Hong Mei. IndoTrack: Device-Free Indoor Human Tracking with Commodity Wi-Fi. The Proceedings of the ACM on Interactive, Mobile, Wearable and Ubiquitous Technologies (IMWUT/Ubicomp 2017) , 1(3): 72:1-72:22 (2017). Haoyi Xiong, Daqing Zhang, Guanling Chen, Leye Wang, Vincent Gauthier, Laura E. Barnes, iCrowd: Near-Optimal Task Allocation for Piggyback Crowdsensing. IEEE Transactions on Mobile Computing (TMC), 15(8): 2010-2022 (2016). Longbiao Chen, Daqing Zhang, Xiaojuan Ma, Leye Wang, Shijian Li, Zhaohui Wu, Gang Pan, Container Port Performance Measurement and Comparison Leveraging Ship GPS Traces and Maritime Open Data. IEEE Transactions on Intelligent Transportation Systems (T-ITS), 17(5): 1227-1242 (2016). Leye Wang, Daqing Zhang, Zhixian Yan, Haoyi Xiong, Bing Xie. effSense: A Novel Mobile Crowd-Sensing Framework for Energy-Efficient and Cost-Effective Data Uploading. IEEE Trans. on Systems, Man, and Cybernetics: Systems (TSMC), 46(4): 445-458 (2016). Tianben Wang, Daqing Zhang, Xingshe Zhou, Xin Qi, Hongbo Ni, Haipeng Wang, Gang Zhou. Mining Personal Frequent Routes via Road Corner Detection. IEEE Trans. on Systems, Man, and Cybernetics: Systems (TSMC), 46(4): 445-458 (2016). Tianben Wang, Zhu Wang, Daqing Zhang, Tao Gu, Hongbo Ni, Jiangbo Jia, Xingshe Zhou, Jing Lv. Recognizing Parkinsonian Gait Pattern by Exploiting Fine-grained Movement Function Features. ACM Transactions on Intelligent Systems and Technology (TIST), 8(1): 6:1-6:22 (2016). Leye Wang, Daqing Zhang, Yasha Wang, Chao Chen, Xiao Han, Abdallah Mhamed. Sparse mobile crowdsensing: challenges and opportunities. IEEE Communications Magazine, 54(7): 161-167 (2016). Bin Guo, Chao Chen, Daqing Zhang, Zhiwen Yu, Alvin Chin. Mobile crowd sensing and computing: when participatory sensing meets participatory social media. IEEE Communications Magazine, 54(2): 131-137 (2016). Dingqi Yang, Daqing Zhang, Bingqing Qu, Philippe Cudré-Mauroux. PrivCheck: Privacy-Preserving Check-in Data Publishing for Personalized Location Based Services, in Proceedings of the 2016 ACM International Joint Conference on Pervasive and Ubiquitous Computing (UbiComp 2016), September 12-16, 2016, Heidelberg, Germany. Yan Liu, Bin Guo, Yang Wang, Wenle Wu, Zhiwen Yu, Daqing Zhang. TaskMe: Multi-Task Allocation in Mobile Crowd Sensing, in proceedings of the 2016 ACM International Joint Conference on Pervasive and Ubiquitous Computing (UbiComp 2016), September 12-16, 2016, Heidelberg, Germany. Xiang Li, Shengjie Li, Daqing Zhang, Jie Xiong, Yasha Wang, Hong Mei. Dynamic-MUSIC: Accurate Device-Free Indoor Localization, in proceedings of the 2016 ACM International Joint Conference on Pervasive and Ubiquitous Computing (UbiComp 2016), September 12-16, 2016, Heidelberg, Germany. Dan Wu, Daqing Zhang, Chenren Xu, Yasha Wang, Hao Wang. WiDir: Walking Direction Estimation Using Wireless Signals, in proceedings of the 2016 ACM International Joint Conference on Pervasive and Ubiquitous Computing (UbiComp 2016), September 12-16, 2016, Heidelberg, Germany. Hao Wang, Daqing Zhang, Junyi Ma, Yasha Wang, Yuxiang Wang, Dan Wu, Tao Gu, Bing Xie. Human Respiration Detection with Commodity WiFi Devices: Do User Location and Body Orientation Matter?, in proceedings of the 2016 ACM International Joint Conference on Pervasive and Ubiquitous Computing (UbiComp 2016), September 12-16, 2016, Heidelberg, Germany. Huihui Chen, Bin Guo, Zhiwen Yu, Qi Han, Daqing Zhang, Xingshe Zhou, Toward Real-time and Cooperative Mobile Visual Sensing and Sharing, in Proceedings of IEEE International Conference on Computer Communications (INFOCOM 2016), 10-15 April 2016, San Francisco, CA, USA. Bin Guo, Huihui Chen, Zhiwen Yu, Xing Xie, Shenlong Huangfu, Daqing Zhang. "FlierMeet: A Mobile Crowdsensing System for Cross-Space Public Information Reposting, Tagging, and Sharing", IEEE Transactions on Mobile Computing (TMC), 14(10): 2020-2033 (2015). Daqing Zhang, Lin Sun, Bin Li, Chao Chen, Gang Pan, Shijian Li and Zhaohui Wu. Understanding Taxi Service Strategies from Taxi GPS Traces. IEEE Transactions on Intelligent Transportation Systems (T-ITS),16(1): 123-135 (2015). Zhiyong Yu, Daqing Zhang, Zhiwen Yu, Dingqi Yang. Participant Selection for Offline Event Marketing Leveraging Location Based Social Networks. IEEE Trans. on Systems, Man, and Cybernetics: Systems (TSMC), 45(6): 853-864 (2015). Zhiwen Yu, Rong Du, Bin Guo, Huang Xu, Tao Gu, Zhu Wang and Daqing Zhang, Who Should I Invite for My Party? Combining User Preference and Influence Maximization for Social Events, in Proceeding of the 2015 ACM International Joint Conference on Pervasive and Ubiquitous Computing (UbiComp 2015), Sept 7-11, 2015, Osaka, Japan. Leye Wang, Daqing Zhang, Animesh Pathak, Chao Chen, Haoyi Xiong, Dingqi Yang and Yasha Wang, CCS-TA: Quality-Guaranteed Online Task Allocation in Compressive Crowdsensing, in Proceeding of the 2015 ACM International Joint Conference on Pervasive and Ubiquitous Computing (UbiComp 2015), Sept 7-11, 2015, Osaka, Japan. B. Guo, D. Zhang, D. Yang, Z. Yu, X. Zhou. "Enhancing Memory Recall via an Intelligent Social Contact Management System", IEEE Transactions on Human-Machine Systems (THMS), 44(1): 78-91, 2014. T. Gan, Y. Wong, D. Zhang and M.S. Kankanhalli, Temporal Encoded F-formation System for Social Interaction Detection, ACM International Conference on Multimedia (ACM MM 2013), Barcelona, Oct 2013 (Acceptance Rate: ~20%). Alvin Chin and Daqing Zhang (editors). 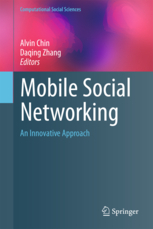 Mobile Social Networking: An Innovative Approach, Springer, 2013.